This week I'm obsessed with... The Body Shop Body Sorbet! 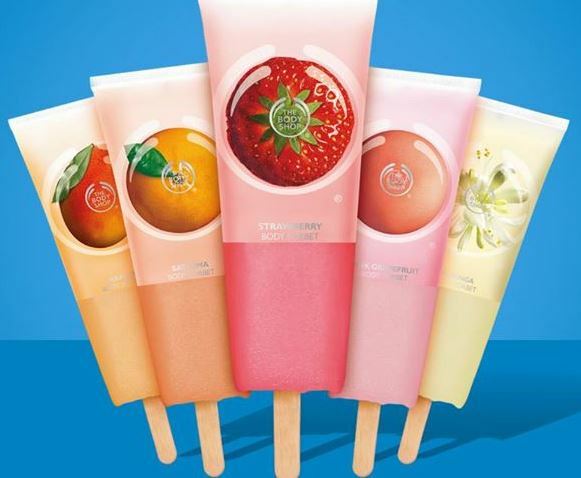 The Body Shop Body Sorbet - 200ml - $15 - available in four fruity flavours: Strawberry, Mango, Pink Grapefruit and Satsuma; as well as one floral fragrance: Moringa - that offer a frosty burst of moisture and freshness to the skin for hydration without the stickiness you can get from some moisturizers. Which makes it not only great for warm weather hydration but is a great choice on over-heated gym skin! Contains 100% organic Community Fair Trade aloe vera from Guatemala and Community Fair Trade aloe. Obviously I'm in love with the Satsuma one - I've tried therapy but it hasn't helped one bit with my Satsuma obsession so I'm just going with it! I can't wait to try these since they look wonderful for summertime.